- The Netherlands joins the Leading Group! In an international arena where innovative financing for development is gaining ground, the Seventh Plenary Session of the Leading Group on Innovative Financing for Development assembled the main players in the field in Santiago, under the Chilean Presidency, on 28 and 29 January 2010. This involved States, NGOs, international organisations, foundations and companies. With the opening address given by the President of the Republic of Chile, Ms. Bachelet, this meeting confirmed the international community’s growing interest in the issue and introduced the initiatives underway to address it. It welcomed the creation of a new education taskforce and set an objective to organise a parallel event during the MDG conference in New York in September 2010. Finally, a joint declaration was adopted to set the future priorities of the Leading Group, whose next Presidency will be assumed by Japan. 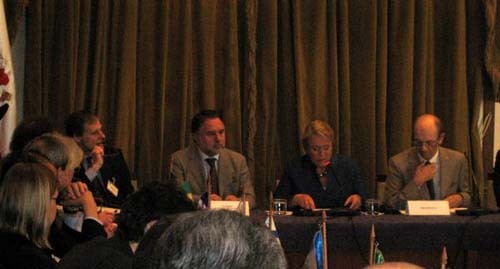 Under the high authority of the President of the Republic of Chile, Ms. Bachelet, and in the presence of the Chilean Foreign Affairs Minister, the Seventh Plenary Session of the Leading Group on Innovative Financing for Development drew a large audience, confirming the international community’s growing interest in the issue. The agenda was introduced by Christian Masset from the Permanent Secretariat of the Leading Group, who set out the Group’s main challenges and objectives and praised the progress made in the initiatives since the last meeting in Paris in May 2009. Virtually all of the Group’s 59 member countries and organisations were in attendance at different levels (Ministers, general directors, ambassadors, directors, department heads), meaning that the Group’s diversity was well represented (several international institutions, the European Commission, several Latin-American countries and some African countries). Furthermore, high-level guests like the director of the IMF’s Fiscal Affairs Department also took part in the discussions. Eight working sessions were set up, specifically dealing with the work carried out in the health sector (1), migrant remittances and their role in development (2), financial integrity and economic development (3), international financial transactions for development (4), hunger and poverty (5), climate change (6), financial instruments (7), with the eighth session on the Group’s mid-term perspectives. A joint declaration was adopted by consensus, setting out the Leading Group’s upcoming priorities. The Group’s Chilean Presidency, coordinated by Mr. Ricardo Ffrench-Davis, showed remarkable efficiency in organizing the meeting. The Group plays a leading role in issues such as international financial transactions, migrant remittances, climate change, health, hunger and poverty, innovative financial mechanisms and stemming illicit financial flows. The Group has been recognized as having a unique role of providing information, taking action and sharing best practices, bringing together states, NGOs and international organisations. Innovative financing has now proved its effectiveness and is today stimulating clear international interest and recognition. An assessment of each ongoing initiative was carried out, followed by discussions with the participants, over eight working sessions. These sessions, by pooling accurate facts and figures on the Group’s initiatives, meant that certain technical aspects of the different mechanisms currently in use or under evaluation could be clarified. They also created an opportunity for the various taskforces within the Leading Group (action against hunger and poverty, illicit financial flows and tax avoidance, financial transactions and development, climate-related issues) to deliver progress reports on their work. 1. During the session on health, the numerous partners associated with initiatives launched three years ago gave progress updates and the results of the air-ticket levy to finance the provision of medicines, from the IFFIm/ GAVI and AMCs, thanks in particular to GAVI representatives, the World Bank and UNITAID. The launch of an expanded IFFIm financed by the United Kingdom, Australia and Norway was confirmed, with the aim of contributing to MDGs 4 and 5. Finally, the “Massive Good” campaign was introduced, which centres around voluntary contributions during the purchase of plane tickets with the aim of financing the Millennium Foundation for Innovative Finance for Health, thus complementing UNITAID resources (access to medicine). 2. The second session on migrant remittances recalled the role and development potential of these resources by returning to the aim of halving costs which was proposed by the Leading Group during the Sixth Plenary Conference and subsequently taken up by the G8 and international financial institutions. Input from Italy, Morocco, France and several NGOs placed particular emphasis on maintaining this progress, notably by fostering the creation of micro-credit institutions in recipient countries. 3. Next, the taskforce on illicit flows and tax avoidance, which was borne of a Norwegian initiative within the Leading Group in 2007, set out its progress, followed by a detailed report of the Global Financial Integrity. Norway, Chile, Spain and the European Commission all stressed the importance of this issue. It was also decided that the Presidency of the Leading Group would soon send a letter to the Canadian authorities (who hold the G20 Presidency) on the taskforce’s conclusions on financial transparency in order to promote faster mobilisation of the G20 and outline our proposals. 4. The next session addressed the work of the Taskforce on International Financial Transactions for Development, which brings together 12 countries responsible for making justified proposals regarding financing for development from international financial transactions in May 2010. These proposals will be backed by a committee of internationally-recognized experts who have just started their work. During a lengthy discussion, stemming from addresses from the Permanent Secretariat, D. Hilman and one of the experts, S. Griffith Jones, the IMF representative stressed the importance of this exercise, which is different to that conduced by his institution (which looks at this issue in terms of partly refunding States the money they spent in response to the crisis in order to save the banking sector). It will submit its report in mid-April. Japan’s statement also attracted a lot of attention. 5. The working session on hunger and poverty drew great interest from Chile and Brazil. This has been a Leading Group issue from the outset, with high-level declarations signed in New York at the opening of the United Nations Assembly General in 2005 and 2008. Contributors from various countries and international organisations emphasised the importance of this issue. 6. The sixth working session involved a discussion of climate change issues, after the side-event organized by the Leading Group during the Climate Change Conference in Copenhagen. The final declaration in that Conference proposed a high-level panel which is being set up by the United Nations Secretary-General on the issue of climate change financing (including “alternative” financing). Germany has a keen involvement in the issue with regard to market mechanisms and in particular its allocation to help adapt climate change of a part of the CO² auction (230 million euros from Berlin in 2009 after 120 million in 2008), with France also having chosen this option. The Leading Group expressed its desire to maintain dialogue until the next COP in Mexico in late 2010 so that the issue can be properly examined. 7. The penultimate session served as a reminder of the importance of issuing extra SDRs both for financing for development (notably French and British initiatives) and emphasizing the links between SDR issuances and climate, in reference to recent announcements by the IMF Managing Director regarding a “green fund”. Chile, which is highly mobilized on this issue, also recalled how important these advances, which were initially proposed in the Monterrey Declaration on Financing for Development, are to the Group. Finally, the Gates Foundation and the World Bank announced that they will be co-hosting a Marketplace on Innovative Financial Solutions for Development, to be held in Paris on 4-5 March 2010. This will be an opportunity to examine all innovative financial instruments being implemented by ODA operators, notably those which are counter-cyclical or insurance-related. 8. The last session launched a new taskforce on education and innovative financing: while taking note of the financing needs of the education sector within the framework of achieving the Millennium Development Goals, in Santiago the Leading Group launched a dedicated taskforce on Jordan’s initiative with the participation of UNESCO, UNICEF, the European Commission, France, Brazil, Chile, Spain and Germany, based on terms of reference inspired by the Leading Group. This session determined that Japan will assume the next Presidency, which was positively welcomed by the entire Group. Finally, it was decided that the Group will organise a side-event during the September 2010 MDG conference in New York and a plenary meeting before the end of the year. The large number of presentations at the conference offered a comprehensive overview of the ongoing work and the results achieved within the organisations and the Leading Group’s member countries. The discussions organized after each session allowed for high-quality, lively exchanges which provided the Group with ideas for preparing its future work and meetings. Among the significant concrete results was the launch of a new taskforce on education with the support of the Queen of Jordan, and confirmation of interest in innovative financing from Japan, which will take over from Chile as the next Group President and will host the next plenary session in late 2010. The meeting ended with a final declaration comprising seven recommendations and stating that the international community must redouble its efforts in order to emerge from the current crisis and achieve the Millennium Development Goals. The United Nations’ Economic Commission for Latin America and the Caribbean (CEPALC), which was an observer at the conference, announced that it would like to join the Leading Group, as did the Netherlands and Ecuador. Lastly, the GAVI Alliance became an official member of the Group on this occasion. Against an international backdrop in which innovative financing is gaining ground, particularly ahead of this year’s United Nations MDG summit and discussions on financing the adaptation to climate change, the fast development and significant results of the Leading Group were commended by all participants. Chile made an excellent job of preparing and organizing this international meeting, notably with the support of Mr. Ffrench-Davis, President Bachelet’s adviser. To continue the work carried out by the Group and by each of its members in order to further the adoption and expansion of innovative financing mechanisms, such as the air-ticket levy and the tax on international financial transactions; market mechanisms, front-loaded financing for immunization programs; the impact of remittances on the market; and voluntary solidarity contributions. To highlight and support the work being done by the Task Force regarding the feasibility of implementing an international financial transaction tax. Their conclusions will be submitted before the eighth plenary session of the Leading Group on Innovative Financing for Development in the course of 2010. To welcome the action of the Group to promote international cooperation in tax matters and the work performed by its Task Force towards achieving financial integrity and tax information transparency, and to ask the Task Force to include in its future work to consider the cooperation with organizations and entities at regional level in Africa, Latin America, Asia, the Middle East, Europe, and North America. Also, we welcome the work done by the International Tax Compact. All country members of the Leading Group were invited to consider promoting and achieving greater transparency in the Global Financial System and, in that context, decided to address this issue in the next Leading Group meeting. To continue working towards achieving a significant and quantified reduction of the cost of remittances and to acknowledge their contribution to development, including fostering the creation of micro-credit institutions in recipient countries. Also, to recognize the work carried out by the Group toward furthering discussions on other innovating financing mechanisms identified in the menu of options of the Technical Report on Action against Poverty and Hunger, such as the CO2 emission credits, a matter that should be addressed in the appropriate Fora. To underscore the importance of continuing to perfect and make full use of risk mitigation instruments, as well as of economic policies that include counter-cyclical incentives and mechanisms. In this context, it welcomes the decision by the G20 and the IMF to develop initiatives, such as the allocation of Special Drawing Rights, to finance counter-cyclical policies, as well as the efforts to combat tax avoidance through tax havens, actions which have been promoted by and enjoy the full support of our Group since its beginnings. Given the increased urgency to attain health MDGs, to acknowledge and expand the significant results to date generated by UNITAID, IFFIms, AMCs, the contribution made by the High Level Task Force on Innovative Financing for Health Systems in the discussions of the Leading Group, as well as the alternative to channel new innovative financing resources toward the educational sector and mother-child nutrition. We applaud the significant progress made towards the implementation of voluntary contributions through the Millennium Foundation for Health. To reiterate that the Group is committed to continuing its contributions toward the achievement of the Millennium Development Goals, in the context of the commitments of the Monterrey Consensus and the Doha Conference regarding development aid, particularly concerning innovative financing. It will lend all the support that is required to ensure the success of the UN MDG’s Review Summit to be held in New York in September of 2010.